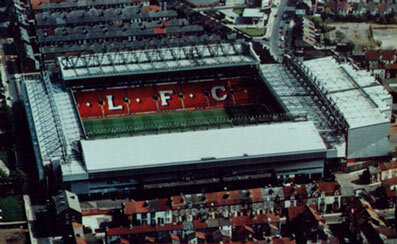 Anfield is situated 2 miles north of Liverpool city centre. Bus route 26 runs along Walton Breck Road and there is a bus stop outside the Kop. The bus starts from Paradise Bus station in the city centre and runs at the rate of about 8 an hour. The fare should be less than pound on matchday with the return journey into the town centre being via the number 27 on the opposite side of the road. From The city centre drive along the A59 towards Ormskirk past the Wallasey tunnel. After the fifth set of lights after the tunnel take the right hand fork of the road up Everton Valley, following the signs here on in to Anfield. Parking is difficult on matchdays with Anfield Road being closed to traffic. The main car park near the ground is Vernon Sangster. To get to the car park turn right at the top of Everton Valley and Notre Dame School. You will see the ground ahead of you. Drive past the ground but turn left just before the petrol station and drive down the lane on to Arkles Lane. Drive down Arkles Lane to the next junction and turn left. The car park is just down the road on the left and no more than a couple of minutes from the ground. The exit to the car park on foot is just by the Arkles pub if you fancy a pint before the game. If you are coming from the M62 motorway take a right onto Queens drive and follow the road until you reach Utting Avenue where you should turn left. Follow the road up to Priory road (signposted as football car parks) and turn right. The car park is just along on your left. If coming from the M57/M58 or North Liverpool then follow the signs for Bootle and turn left at Bootle golf course following the road along Southport Road right up to Breeze Hill Junction(Hillside High School) and turn left. Follow the road over the flyover along the drive until you reach Utting Avenue and turn Right up here following the football car park signs until Priory road and turn right. The car park is on the left. A taxi from the city centre will cost around £5. If arriving at Lime Street then you should get on to the underground system through to Central or Moorfields and get a train on the Northern Line towards either Kirkby or Ormskirk. Alight at Kirkdale or Sandhills and you will have to walk the mile and a half or so to the ground which is right after coming out of the station. Taxis are usually around or a special bus service operates from Sandhills station before and after the match. There are a number of pubs around the ground worth a visit. The Albert is the closest of all pubs, being situated right outside the Kop with the Park on the opposite side of the road. Staying at the Kop end of the ground the Salisbury and Stanley are en route from Everton Valley as you walk to the ground. If you are coming from the opposite end of the ground to the kop there is Sam Dodds and the Sandon. If you are coming from the Centenary side of the ground then the Arkles is worth a try. There are also a number of fast food vans near the ground with the EverPool van serving particularly good food at reasonable prices. This is placed outside the Anfield Road/Centenary gates. There are decent chippies at the kop end of the ground too whilst McDonalds are situated in the Kop. Hotels in Liverpool range from the Moat House, Adelphi, Swallow, Atlantic Tower and the Crown Plaza. Some cheaper alternatives in the city centre include the YMCA or small hotels near Lime street Station.